Цена в точки: 27450 т. Stronger than ever, The world’s performance benchmark has now been set. 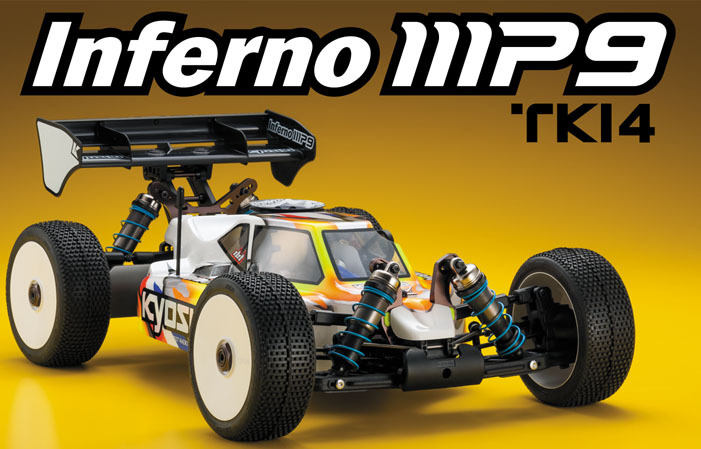 With eyes on the ultimate prize of its 9th IFMAR World Championship title to be contested in the USA in October 2016, Inferno developer Yuichi Kanai has evolved the Inferno MP9 through 4 years of trial and error to produce the TKI4 model. Built for faster speed than the former TKI3, the new TKI4 features revised front/rear suspension for improved cornering stability and sharp control characteristics. A newly designed body and rear wing produces superior aerodynamics for high-performance cornering and traction. Improved driving performance goes hand-in-hand with enhanced maintenance and improved durability that can be relied upon during the critical stages of the race. Chassis structure and parts come together with precision and efficiency so the TKI4 can be recommended for serious buggy racers as well as those wanting to take the challenge of driving the ultimate 1/8 GP buggy. Includes newly designed body that perfectly balances all factors for front end turning, cornering and traction performance. 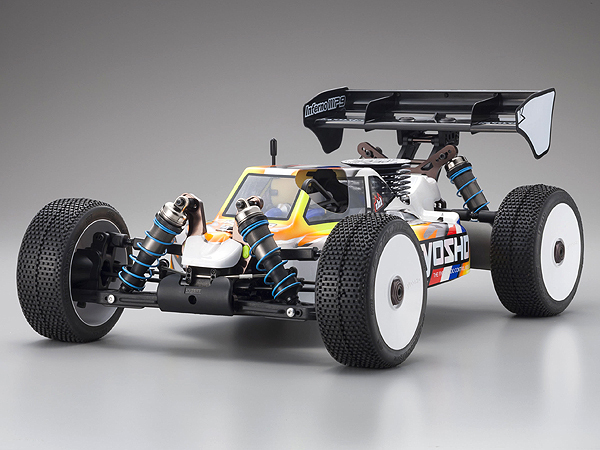 Front suspension arm is 2mm longer than the TKI3 and ribs have been added for more strength. Delivers both improved line control and cornering. Big bore shocks with f1.5×5 hole pistons that power the chassis over rough track surfaces. Front universal shafts and tie rods have also been lengthened and upgraded with reinforced tie rod ball ends. Newly designed rear wing features 2 additional vertical fins for greater stability over jumps and removable gurney flap for increasing rear grip. Features newly engineered wing stay with increased mounting surface area for a more stable mount and to prevent damage and deformation. Newly tooled air cleaner holder and fuel filter holder prevent movement of fuel line to avoid engine trouble. New durable tapered wheel design. Special surface on mounting area allows easier and stronger bonding with the tire. 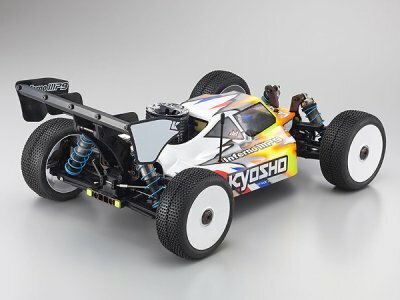 Chassis layout maintains the TKI3’s front mount of the receiver battery for superior handling.